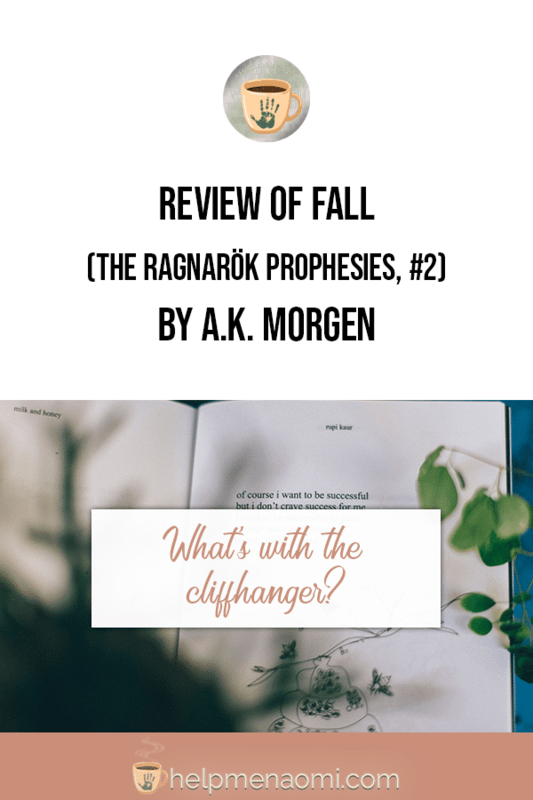 Yet another long overdue review, this time for my review of Fall (The Ragnarök Prophesies #2) by A.K. Morgen. As this is so long overdue, I won’t waste a lot of your time dilly-dallying about. I’ll just get straight to the review. If you have not already read Fade (The Ragnarök Prophesies #1) by A.K. Morgen, stop reading this and go read that novel. Now. In Fall (The Ragnarök Prophesies #2), A.K. Morgen picks up right where she left off with the first book. And she does this brilliantly. Fade was great, awesome even, and set the bar for this series to be fairly high. Fall is spectacular and continues to raise the bar. The positives: A.K. Morgen fills in more of the myth background–she really dives in. This book also covers a lot of the relationship between Arionna, Dace and their respective wolves, illuminating just how important they are to each other. Ronan’s character is also explored in much more depth, which is very nice. The negatives: Come on! What’s with the cliffhanger? This book left me pining for book three. I guess that should be listed as a positive, as it is a mark of a very good book… But since the sense of pining annoyed me slightly, and it left me wanting to read book three right in the middle of my maternity leave but unable to read book three (because it’s still being written and all that)… well, you get what I’m saying. Star Rating: 6 out of 5.